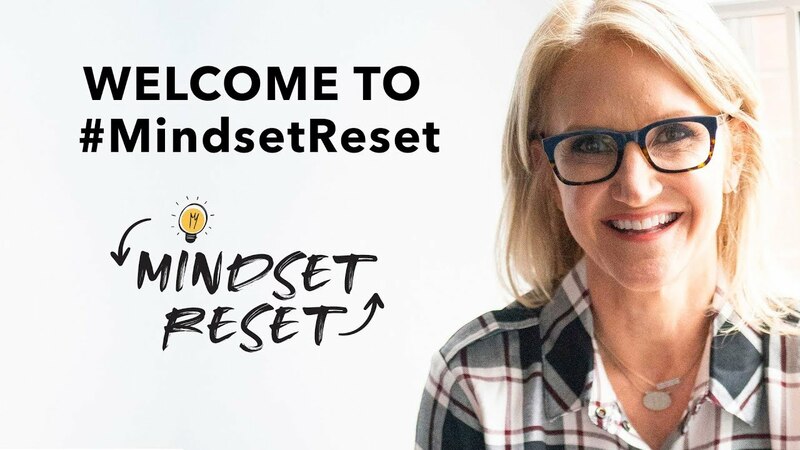 Mel Robbins -- Mindset Reset! This might come as a surprise to some of you, but I'm not always a positive thinking, happy-go-lucky person. Sometimes, in fact more often than I'd like to admit, I get down on myself, beating myself up for not being more clever, or quicker/better at work, or fitter, or myriad other commonplace things. It doesn't particularly matter my level of achievement in each/any of those areas, I still feel like I should be better. Worse still, I have a tendency to, once I've started with a negative attitude, find reasons to perpetuate that attitude. Suddenly, EVERYTHING is terrible, NOTHING works right, and the entire universe is against me. This attitude makes me pretty unpleasant to be around -- and to be honest, I don't like being around others when that bit of darkness has seized me. At the end of last year, she caught wind of a new program Mel Robbins was offering. It was going to be entirely short, web-based, live trainings, and opting in was free. The series was titled "Mindset Reset." Given the challenges she'd been facing with her back, she was really interested in seeing if going through a program like this would be beneficial, and asked me if I'd be interested in doing it too. I didn't really think I'd get much out of it, but it certainly wouldn't hurt to give it a try, so I said "yes." At first, I felt justified in my skepticism. Mel went over some pretty common sense things that I already do. But it didn't take long for her to start offering some insights and things to try that were novel for me and immediately beneficial. She spent time early on talking about visualization, which is something I was already familiar with. The insightful part was when she explained how combining the imagery with the projection of the emotional content formed extra connections that help the visualization become impactful. She demonstrated a specific ritual around journaling. She made a pretty compelling case for why this is the way to do things. I won't get into it, since it's covered really well here. Suffice to say that I had been journaling pretty steadily since last April, so this wasn't a huge challenge for me. I was really surprised to find that, after making the changes she suggested, I was doing it EVERY DAY, including weekends. As I mentioned earlier, I have a tendency to descend into dark moods sometimes. One of the things Mel suggests is to actually identify the negative patterns in your thinking so that you can think something else when they arise. Just paying attention to the ways I beat myself up sometimes and switching those thoughts to something more positive has been an interesting experience. The first day I tried it, I realized I hadn't thought a single negative thing all day, and assumed it was going to be a piece of cake from then on. Then, the next day happened. Luckily, I don't have a deep pattern of negative thinking, but I have my moments. Recognizing when they're happening, and using the 5 Second Rule (for which Mel is most well known) to switch the thought to a positive anchor, has really helped. I can only think of one time in the past couple of months where I just mindlessly raged, and given everything that's going on, that feels like quite a lot of forward progress. I did find out one other interesting thing that I've suspected since high school -- I don't do well getting up before 6 a.m. for extended periods of time. In high school, in order to attend Driver's Ed, I had to get up at 05:50. Those days were always rough. I've observed it off and on over the years, but it fully quantified during January and early February. Six weeks of getting up between 05:00 and 05:30 in order to get journaling done before exercising was wearing me out to the point where I felt run down all the time. Tanya finally suggested that we shift our schedule to where I sleep until 06:00 or 06:30, and then get up together to do morning routines. I've felt dramatically better since then, despite my shoulder still being wonky. I never mentioned the second reason I brought this up. It's because I suspect I'm not the only person that tortures themselves and their coworkers/friends/loved ones similarly. If you've struggled with similar issues, or are dealing with anxiety or stress and aren't sure what tangible, practical steps you can take to progress, I strongly encourage you to work through the Mindest Reset series on YouTube.